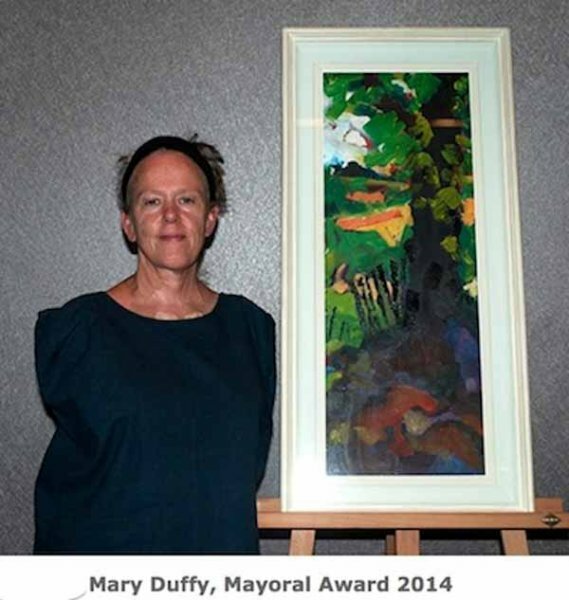 Mary Duffy was presented with the Gold Mayoral Award (€1,000) at the seventh international Art in the Open Festival in Wexford. Awarding her the top prize at last weekend's Festival in Wexford, the chair of the judges, Sinead Rice, announced that Duffy's painting, "Purple Rasta" embodied the spirit of the festival and was "vibrant and energetic". From Newcastle, Co. Wicklow, she also secured the most coveted prize - the artist's choice award (for her entry in 2013). An essential component to the festival is that the work is completed in one one day, onsite, and in the open. All of Duffy's landscape are carried out in this way. She says that painting on site means that the work has a freshness, immediacy and vibrancy that it very rewarding to do and impossible to create in the studio. "Over the last seven years I have attended all but one of the festivals. I have gotten sunburned in Clonegal and soaked on South Main Street. I've gotten blown by the gales at The Hook. It's never been easy. But I have had the opportunity to engage and to participate, because, despite the challenges, or maybe because of them, I am good at what I do. And so, I keep coming back", she says. No stranger to this International Festival, she also secured the runner up prize for her painting 'Gully at The Hook' in 2012. "I'll keep coming back because I know it is about participation. This festival is about the action of taking part. It is about being involved, and taking risks. It is about a coming together of both professional artists and "dabblers" and everyone in between. This is rare in the art world, a world that is full of its own importance, busy with creating hierarchies and structures designed to exclude and intimidate. Against this backdrop, it is very difficult for this festival to strike the right balance - to be inclusive, and yet smooth in terms of organisation, to be professional, yet volunteer-based, to be welcoming and flexible and still keep it's head when things start going pear-shaped. I have great admiration for the Festival. The organisers create a truly magic atmosphere here and they deserve to see it go from strength to strength while they can still retain its original spirit, vitality, vision and verve. * To celebrate and promote the practice of painting outdoors, from life. * To encourage a network of similar groups within Ireland and Europe by the provision of an annual focal event. * To stimulate a public awareness and critical appreciation of plein air painting. * To provide a forum where artists can learn from one another and develop technically and aesthetically together. These are still our aims in developing Art in the Open but it has since grown to become the largest annual plein air festival in Europe and it has given rise to many international friendships and introduced many Irish and overseas visitors to the hospitality of Wexford as well as to the varied delights of the landscape of south east Ireland. In return, to the places it visits the festival lends a relaxed and cultured ambiance one normally associates with centres like Venice, Paris or the south of France where easels, paint and canvases on the street are not so remarkable. Almost 200 p artists from Ireland, Finland, Bulgaria, Holland, France, Russia, Spain, Australia, UK and USA took part to produce an exhibition of over 300 paintings. Now in its seventh year, the festival has an established reputation for quality and a panel of three eminent artists select winners of the exhibition awards that included nine other awards. Generous art material prizes will also be awarded to winners of the People's Choice and the Artists' Choice awards bringing the total value of awards to approximately €5000.